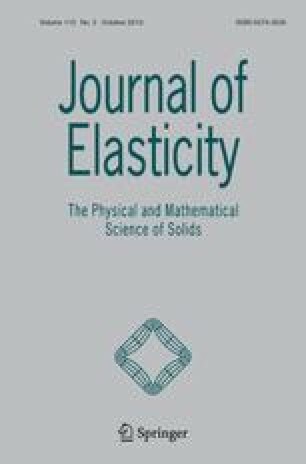 This work focuses on the construction of equilibrated two-phase antiplane shear deformations of a non-elliptic isotropic and incompressible hyperelastic material. It is shown that this material can sustain metastable, two-phase equilibria which are neither piecewise homogeneous nor axisymmetric, but, rather, involve non-planar interfaces which completely segregate inhomogeneously deformed material in distinct elliptic phases. These results are obtained by studying a constrained boundary value problem involving an interface across which the deformation gradient jumps. The boundary value problem is recast as an integral equation and conditions on the interface sufficient to guarantee the existence of a solution to this equation are obtained. The contraints, which enforce the segregation of material in the two elliptic phases, are then studied. Sufficient conditions for their satisfaction are also secured. These involve additional restrictions on the interface across which the deformation gradient jumps — which, with all restrictions satisfied, constitutes a phase boundary. An uncountably infinite number of such phase boundaries are shown to exist. It is demonstrated that, for each of these, there exists a solution — unique up to an additive constant — for the constrained boundary value problem. As an illustration, approximate solutions which correspond to a particular class of phase boundaries are then constructed. Finally, the kinetics and stability of an arbitrary element within this class of phase boundaries are analyzed in the context of a quasistatic motion.